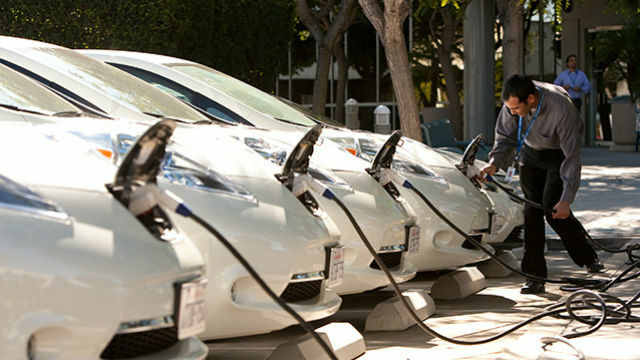 San Diego Gas & Electric announced Thursday it will install thousands of electric vehicle charging stations throughout San Diego and Orange counties under a pilot program approved by California Public Utilities Commission. The company will install charging stations at up to 350 businesses and multi-family communities, with 10 chargers at each location for a total of 3,500 separate chargers. At least 10 percent of the chargers will be located in disadvantaged communities. The program is designed maximize the use of renewable energy to charge electric vehicles and minimize the need to build new fossil-fuel power plants. In 2012, Gov. Jerry Brown set a goal of having 1.5 million zero-emission vehicles on the road in California by 2025. SDG&E said that for the San Diego region to meet its share of 10 percent of that target — 150,000 electric vehicles — much more supporting infrastructure is needed. Currently the region has only 19,000 electric vehicles.